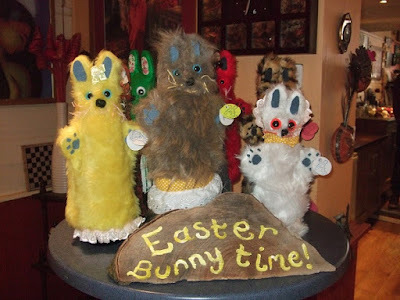 What do you think of these rather wonderful Easter Bunny glove puppets? I photographed them at the Lazy Gecko cafe in Glastonbury yesterday when I stopped of for lunch and shopping on my way to Bristol for the Assap conference on fairies, which is happening this weekend. Apparently you can buy the bunnies on Etsy at Moonrabbitpuppets.